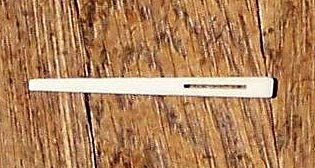 This is an ivory bodkin, photographed laying across oak flooring - it's about 4" long. A "bodkin," you say? As in, Shakespeare's "Odd's Bodkin"? Yes, it's one and the same. Bodkins were essential for dressing, before the inventions of buttons, hooks and eyes and of course, zippers. The bodkin is used much like a needle, to pull ribbon (or a leather strip) through a hem. The ribbon then becomes a tie to hold clothing together, such as on a cloak, chemise, laced vest, petticoat, or an apron. Only later, when we had other, more familiar ways to close clothing, did ribbons became merely decorative. This bodkin is part of one of the needle kits owned the Park and McCullough ladies. It has a nice round end so it won't snag on cloth, as well a wide eye for the ribbon. And although I can quilt and knit adequately, I'm no expert on needlework, so I learned a lot working on the exhibit. And now I've held a bodkin.